Two boy-men sat on the river's eastern bank, where an open-fronted tent gave them shelter from the chilly spring wind. Slowly Evvy drifted to the end of the procession that followed Emperor Weishu, Rosethorn, and Briar through the series of garden they had entered shortly after dawn that morning. On their way to the first Circle temple in Gyongxi, mages Briar, Rosethorn, and Evvy pay a visit to the emperor's summer palace. Although treated like royalty when they first arrive, the mages soon discover that the emperor plans to invade Gyongxi, posing a fatal threat to the home temple of the Living Circle religion. Accompanied by one of the emperor's prize captives, the three mages rush to Gyongxi to warn its citizens of the impending attack. With the imperials hot on their trail, Briar, Rosethorn, and Evvy must quickly help the country prepare for battle. But even with the help of new allies, will their combined forces be enough to fight the imperial army and win the war? 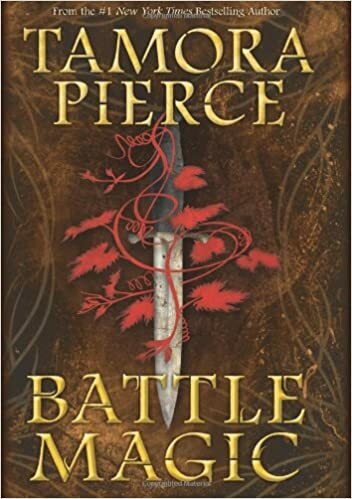 I lost track of Tamora Pierce! Thanks for reminding me. I read most of her quartets. You have captured my attention!! Happy weekend! What a great cover to showcase this book. I'd like to try this author. Thanks for sharing - sounds like a captivating book. Enjoy.